‘On The Spot’ – Soundwave Festival 2011 – Spotlight Report "The Best Entertainment Website in Oz"
On 27 February 2011, Sydney Olympic Park was transformed into one of the biggest rock venues as Soundwave Festival hits the city loud and proud, with Metal Gods, Iron Maiden as the headliners of the event. Doors opened early, with tons of fans waiting outside to start the rock party as soon as possible. The place had a great setup with not much distance from one stage to the other, and enough stalls to grab food or drink to get through the hot day, not to mention massive showers installed to refresh everyone at the venue. 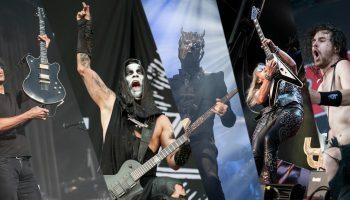 The first band we saw was the Norwegian-Icelandic black metal Dimmu Borgir, hitting the stage with a thumping loud show, belting out all their signature songs. Then we saw the always great Devil Driver, with Dez Fafara doing what he does best, pumping his energy to the crowd non-stop, playing hits like ‘Devil’s Son’. Bullet from my Valentine was next who did a memorable gig as every band member took over the stage for each song where the major highlight was when Bruce Dickinson’s son Austin jumped on stage to sing ‘The Last Fight’ and ‘Scream Aim Fire’ with the band. After Bullet, the spotlight moved from the main stage to the metal one as Sevendust and A Rise to Remain were ready to rock and they did it in a way that only the best bands can do with strong sets, a surprising Austin Dickinson following in the footsteps of his dad and the always energetic Lajon Witherspoon from Sevendust singing out his soul in every song. The day seems to fly by as so many great bands kept you running from one stage to the other between shows (thank god there weren`t many clashes!) 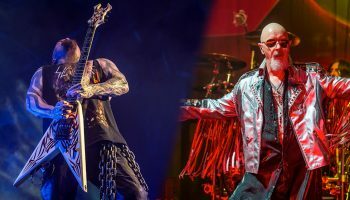 and we had the chance to see 2 bands featuring Slipknot members, both in totally different styles – Corey Taylor‘s Stone Sour (including Slipknot`s guitar player Jim Root) and Joey Jordison and Wednesday 13’s Murderdolls. Both bands put together such a great show, making the crowd go absolutely wild, with Corey Taylor and his band mates demonstrating the quality of Stone Sour in hits like ‘Get Inside’ and ‘Hell & Consequences’, who despite the hot day, didn`t stop jumping. Almost clashing with Stone Sour, Murderdolls Jumped onto the Metal Stage in their iconic makeup and dark music and lyrics, fanning more fire to the atmosphere with lots of Rob Zombie and Slayer fans in the mosh pit for this great band that obviously performed their massive hit `Nowhere’ and their cover ‘Twist my sister’. Primus kept the party going with their unique sounds and amazing skills of Les Claypool. Slash already rocked around Australia this year promoting his fantastic solo album with the great Alter Bridge front man Miles Kennedy. Both of them took over the stage in a great set including hits from the solo album and obviously from Guns N Roses closed their show in the always epic tune of ‘Paradise City’. Following from that, we took a break to see 30 seconds to Mars, a band targeting a younger crowd with a very versatile Jared Letto changing his clothes all the time as the entire crowd sang along to songs like ‘Closer to the Edge’, where Jared used a super soaker to get into the sea of people and even dressed as an American Indian at the end of their 7 songs set. 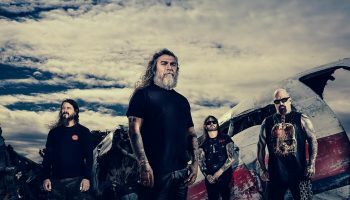 An unfortunate moment at the venue was the absence of Slayer’s front man Tom Araya due to illness, forcing the organizers to cancel the Slayer set and making an enormous amount of Slayer fans go mad with frustration, throwing plastic bottles and cursing around for the huge disappointment, which gave us the choice us to see One Day as a Lion. On the main stage, Rage against the Machine’s frontman Zack de la Rocha and his alternative band ‘One Day as a Lion’ was a bit out of the place for the festival, and despite the energy and the great voice of Zack, it did not excite the crowd much, as people looked confused and wished for a Rage Against The Machine instead, which could not happen. Rob Zombie was one of long-waited artist to perform so a massive crowd went to the metal stage even though it clashed with Iron Maiden and Queens of The Stone Age! However a technical issue with Zombie`s famous screens delayed his set for about 25 minutes, leading some of the fans back to the main stage to see Iron Maiden. But this issue did not stop Rob Zombie performing some amazing numbers in his typical style (like a massive claw on his hand) and Joey Jordison on the drums doing a solo for the joy of the Zombie-Murderdolls-Slipknot fans. Zombie also brought back one of the biggest mosh pits we’ve ever seen with all his fans jumping, pushing and singing every song, despite a hot and at times a long day. Queens of The Stone Age was playing at the same time on the main stage so we saw their last 2 songs of ‘No One Knows’ and ‘ The song of the Dead’, with a great lighting display complementing a great performance. At almost 8 pm, the lights went off and the sounds of ‘Satelite’ made everyone scream as Iron Maiden was about to come on with the metal that made the band an icon of pure rock. As Maiden took over the stage in their always classic energy, all the members performed in their own style with a spectacular and acrobatic Janick Gers, the quality of Adrian Smith, the solos from Dave Murray, the power and metal of Steve Harris, the strong rhythm of Nico McBrain and obviously the energy and the voice of frontman Bruce Dickinson. Maiden played a full set of 17 songs including classics like The Trooper, Fear of The Dark, The Number of the Beast, plus some songs from their new album The Final frontier, like ‘El Dorado’ and ‘The Talisman’. A very talkative Bruce Dickinson interacted with the crowd and even joked saying that they will come back when Australia defeats England in Cricket. Obviously, Maiden’s famous pet, Eddie also jumped on stage, and this time even playing the guitar as another member of the band. The UK band closed this perfect event with Running Free, extending the song considerably in between to thank the Australian public for their support and promised to come back soon. 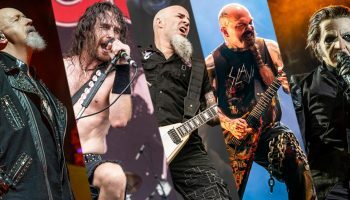 Undoubtedly this was one of the best Soundwave Festivals in all its history in our opinion! Bring it on Soundwave 2012! Big Day Out 2012 Official Mobile App Is Here! New Features Include Schedule Sync! Pls guys give tickets away for Sydney!! !